** 3 Days Until the Flashversary!! Festivities will run Dec 2 -6: SHOCKING! FIVE WHOLE DAYS to write & submit your stories for prizes and worldwide (minor) celebrity. Set your clocks NOW. If you’re like me and tend to forget things, set your clocks yesterday. This week’s personalized educational experience is headmastered by outgoing SVW judge and Arthurian legend-obsessed Jaz Draper, who will liberally award gold stars to writers offering well-rounded characters and crisp dialogue. Be sure to check out her judge page to learn how to escape having your name written on the board. * Word limit: 100 word story (5- word leeway) based on the photo prompt. * How: Post your story here in the comments. Include your word count (95 – 105 words, exclusive of title) and Twitter handle if you’ve got one. * Prize: An informational e-dragon e-badge, a scholarly and illuminating winner’s page here at FF, a 60-second interview feature in detention next Wednesday, and YOUR NAME blasted in high-pitched musical tones in the morning announcements of schools around the world. NOTE: No more Flash Points until Year 2. 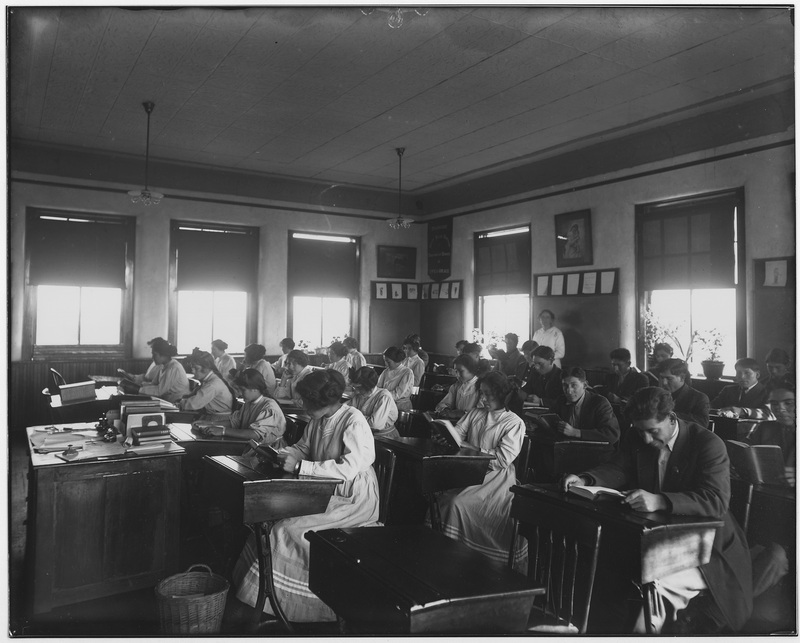 Miss Robertson’s School Room (1913). Public Domain photo. National Archives Bureau of Indian Affairs. Our newest Flash! Friday winner is Jackie Castle. Read her winning story here, then take one minute to get to know her better. 1) What about the prompt inspired you to write your winning piece? 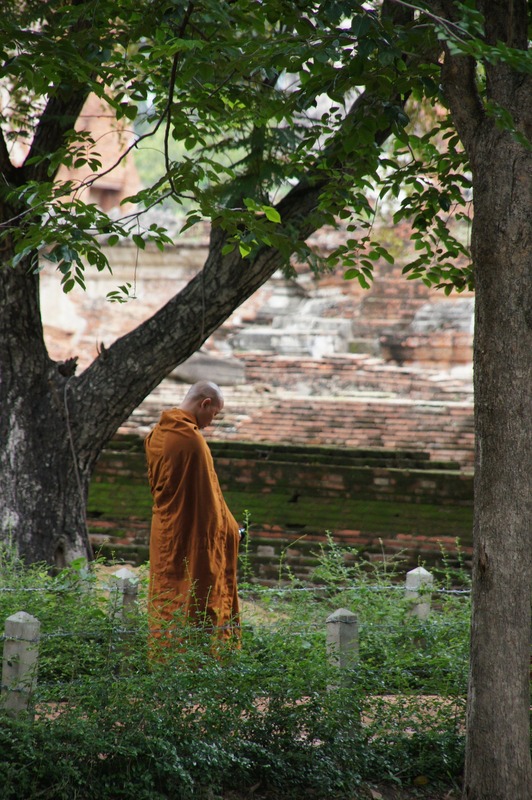 Your challenge caused me to consider times when we are most likely to be contemplative. I wrote about that moment. 2) How long have you been writing flash? Umm, about a month, maybe two months now. I’m hooked. 3) What do you like about flash? The opportunity to let go and allow myself to write what I normally don’t write about. No restraints. 4) What flash advice would you give other writers? Don’t think too much. Keep it simple, but don’t be afraid to explore ideas you normally hold back on. 5) Who is a writer we should follow, and why? So new to this, I’m honestly not sure. Fave authors are Neil Gaiman, Cassandra Clare, and a few others. 6) Do you participate in other flash contests, and which? I’ve also entered the Finish That Thought challenge. 7) What other forms do you write (novels, poetry, articles, etc)? I have two teen fantasy novels out, a third in progress. Also have short stories in two anthologies. 8) What is/are your favorite genre(s) to write, and why? Favorite genre is fantasy because anything is possible. 9) Tell us about a WIP. I’m working on book 3 of my fantasy series for teens titled The White Road Chronicles. Flash! Friday # 51 — WINNERS! I wanted to be all avant garde and announce the winners in silence today, but hanged if I could figure a way how to do that. Words are just too powerful, it would seem (much as I would appreciate the irony). And so please allow me to express aloud the gratitude in my heart to all of you for sharing your stories with us this week. Thank you! This week’s swan song is sung by Sweet Songstress Beth Peterson, whose love for beauty and elegance has seeped through every pore of her judgery this past year. Thank you, dear Beth, for giving of your time and self so graciously and eagerly. We’re forever grateful! THE COUNTDOWN GOES WILD! Flash! Friday Flashversary Festivities launch in one tiny week, Dec 2-6, and Year 2 will kick off Dec 13 with a brand new judge panel. You will get to know our first quarter judges better in the coming months, but for now it is with tremendous honor & excitement I introduce their (familiar) names to you: M. T. Decker, Whitney Healy, Erin McCabe, and Nillu Nasser Stelter. Welcome aboard, dear ones! Judge Beth Peterson says, You, yes, YOU, have so greatly enriched my life this past year! THANK YOU!! It has been such an honor for me to be a part of Flash! Friday! (And I’m looking forward to this coming year!) 😀 All of you have produced some wonderful work in this past year of Flash! Friday. There have been *so* many stories I’ve read that are honest-to-Pete gems. But not only that…. I also want to congratulate *each and every* person who has put their work out on the line (because, hey! It’s *tough* to present your creative work to strangers for evaluation…even when you know the people involved are supportive and want to see what you are doing). 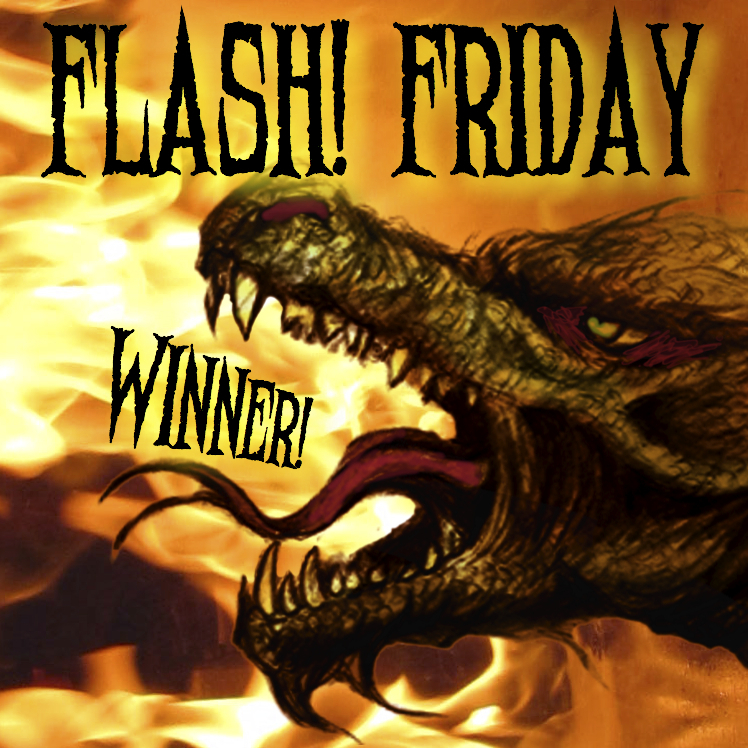 And further, I congratulate all of you who have entered Flash! Friday multiple times, whose work I have seen develop and deepen over this past year! Writing is a skill! Never, ever let anyone tell you it isn’t! In addition, like all skills, it is work to begin, and work to build those skills to ever-higher levels. It helps to read about skill-building in writing, but it also *requires* practice. And not talking about “I’m writing in my head”, LOL…. I know we all do that. I am writing in my head all the time! BUT… that is a mere shadow of writing for real. Whether you’re writing on an electronic tablet, an old yellow school tablet (like we had when I was a kid), on a really old schoolhouse slate, or even writing in cuneiform on a clay tablet! Practicing our writing skills is the only way to truly improve our writing. SO KEEP IT UP, you wonderful, creative, courageous people!!!! 😀 As we enter Flash! Friday’s second year, I can hardly wait to see what wondrous, thought-provoking, rib-tickling stories are shared! M. T. Decker, “Singing a Dragon’s Praise.” This was well-drawn writing, but the crazy humor of the twist had me laughing and then smiling for quite some time! Thank you! Marie McKay, Untitled. I love how the prompt led to this unexpected story! The moment of quiet, yet shattering, realization. The decision to revive some of that which has been lost. It speaks to me, for I, too, mourn the passing of the handwritten word. Ian Martyn, “Choosing.” This really captures that moment of life when we are at a true crossroads. I like the sense of contemplation and the straight-forward, striped-down-to-the-essentials question of direction facing the narrator. I think the use of the first-person POV heightens that impact. Erin McCabe, “Liminality.” From the title (liminality: the sense of ambiguity or disorientation that often occurs during the middle stages of rituals), through to the stop-and-think “allusions of ubiquity” I was drawn into the rather self-conscious and self-consciously “apart” world of the initiate…in this case, Tenzin. The use of language really works well to impart that sense of separation between Tenzin (encased within the monastic life and Buddhist expectations) and the experience of life as a human being. The last paragraph poignantly touches on that conscious decision that Tenzin makes, leaving the teachings behind and stepping into the embrace of what he is experiencing. I have to wonder how this will change Tenzin. Will this decision lead to other, perhaps life-defining, decisions? Congratulations, Jackie! Here is your thoughtful Winner’s Page, a dreamily contemplative yet loud dragon eBadge (below), and your winning Tale. Please contact me asap here so I can interview you for Wednesday’s #SixtySeconds feature.